But, then her sister was curious and asked to sit down with her on the couch and read it, and see what this book was about. I listened from the kitchen as the girls took girls reading pages in this cute new picture book, which released back in January. And, when they weren't reading the story to each other, they were giggling, or stopping to talk about the illustrations. 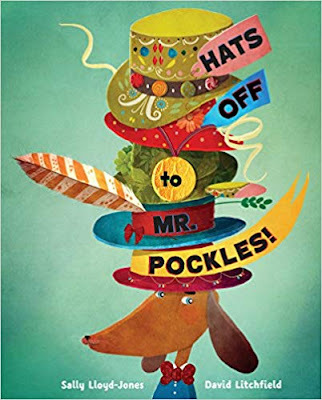 As the title mentions, this book is about Mr. Pockles' hats, and boy does he have a lot of them...too many to wear all at once, and hard to choose one to go out and about with. 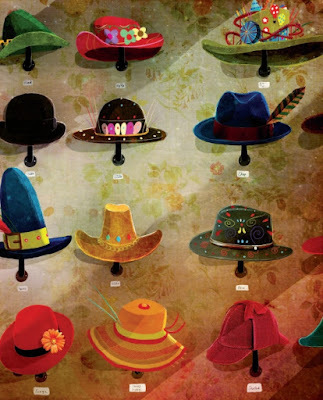 To have a predicament like this..."what hat to wear?" My girls sat talking about the different hats and pointing to their favorites. They also wondered what they would do if they had a collection of hats like Mr. Pockles. It wasn't until near the end of the book that the girls had that "ah ha" moment, where they figured out how the story would end. And, when they got to the end of the book, they both turned to each other and said, "See, we guessed right! ", almost in unison. Even though the girls figured out how the story would end, even before getting to the last page, they both enjoyed this book thoroughly. They loved the story, and how it centered around friendship, helping others and giving without expecting anything in return. Mr. Pockles sure did have a lot of hats, but when he saw someone in need of a hat, he knew what he had to do. And, he get giving, so that the whole town was decked out like he likes to be in a hat, and that made for a wonderful ending to this cute picture book. We have had this book for a short time, but it has become a favorite with my girls. Either they ask me to read it to them at bedtime, or they will pull it from the shelf to read. I have even found my girls drawing hats they see from the book, and coming up with their own unique hats that they feel would be great additions to Mr. Pockles hat collection. 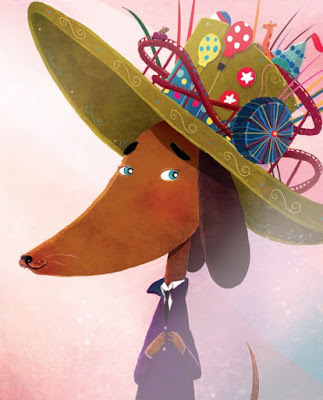 "A New York Times bestselling author and a rising-star illustrator present an utterly hilarious, oh-so-silly tale about Mr. Pockles, an odd little dog with a big hat collection—and an even bigger heart. For Mr. Pockles, going without a hat is as unthinkable as going around without any pants on. He has millions of hats, for every occasion—an Eating His Cornflakes hat, a Drinking Cups of Tea hat, and even an In the Bath hat—but for some reason, he doesn’t have any friends. One day, when Lady CoCo Fitz-Tulip—a Very Important Panda—finds that her hat has been gobbled up by some hungry bunnies, Mr. Pockles knows just how to help. Overflowing with silliness, here’s a charming celebration of friendship, inclusion, and the joy of sharing."